Kusamura Bonsai Club: 59th Annual Show, Lucie Stern Community Center, 1305 Middlefield Road. Show hours are Saturday Noon – 5 PM and Sunday 11 AM - 5 PM with a demonstration at 1:30 PM each day (Saturday's demonstration provided by Sam Adina and Sunday demonstration provided by club members). Free admission. Bonsai trees, pots, and other bonsai-related items will be for sale. For more information contact Charlene Fischer at charlenerae@mac.com or visit www.kusamurabonsai.org. Watsonville Bonsai Club: 46th Annual Bonsai Exhibit will be held at the Watsonville Buddhist Temple, 423 Bridge St. Show hours are 11 AM - 4 PM, with a demonstration by award winning Bonsai Master Katsumi Kinoshita at 1:30 PM. Over 50 outstanding large, small, young and old bonsai will be on display. A raffle of bonsai items, plants and the demo tree will follow. Tea & cookies will be served. Plenty of parking for vehicles of all sizes; even for group outings. Member / Vendor Sales area. For more information contact Michael Anderson at (831)247-9028 or margiesmemories@aol.com. Sacramento Bonsai Club: Annual Spring Show at the Buddhist Church of Sacramento, 2401 Riverside Rd. Show hours are 10 AM – 4 PM, with a Sam Adina demonstration at 1:30 PM, both days. Large member sales and vendor areas, free admission and plenty of parking. The benefit drawings both days will include the demonstration tree and many bonsai and bonsai related items. For additional information visit our website: http://www.sacramentobonsaiclub.com or contact Lucy Sakaishi-Judd at (916) 300-8103 or e-mail juddbonsai@att.net. Akebono Bonsai Club and Kashu Suiskei Kai: Annual Show held at the Palo Alto Buddhist Temple, 2751 Louis Road. Show hours are Noon - 5 PM with a demonstration on each day at 2 PM. Free Admission. Bonsai trees and other bonsai related items will be for sale. Raffle drawings for door prizes and demonstration trees immediately following each demonstration. Must be present to win. For more information call Gary at 650-703-1587. Bay Area Satsuki Aikokai: 24th Annual Satsuki Bonsai Spring Show "Flowers Abound" at the Lakeside Park Garden Center, 666 Bellevue Ave., Lake Merritt. Show hours are Saturday 10 AM - 5 PM and Sunday 10 AM - 4 PM. 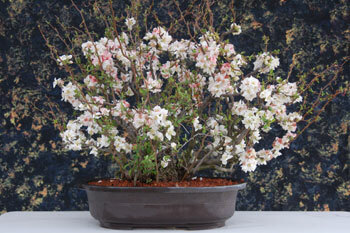 Featuring Satsuki Azalea Bonsai in full flower bloom. Expert demonstration on styling, educational forums all day, member sales with beginner and Japan imported materials, vendors, silent auctions. Free admission and public parking available. For further information contact George Haas at gwhaas@comcast.net or visit club website http://satsukiazaleabonsai.org. Sansui Kai: Annual Bonsai Show at the beautiful Japanese Garden, 6100 Woodley Ave. Show hours are 10 AM - 4 PM with a demonstration at 1 PM. Come view member trees, members sale table, Bonsai demonstration and tour the beautiful Japanese Garden. For more information contact: Steve Riley at tonapahal1953@gmail.com. Sei Boku Bonsai Kai: 36th Annual Show at the San Mateo Garden Center, 605 Parkside Way (next to Beresford Park). Show hours are 10 AM - 4 PM both days with demonstration from 1 – 3 PM. Demo tree will be raffled. Large club member plant sale, vendors, door prizes and our always popular raffles. Admission is free. Dr. Bonsai will be available to offer styling and care tips. For more information contact Marsha Mekisich at eclectic.gardener@yahoo.com. Las Vegas Bonsai Society:On Sunday, June 2, 2019 Todd Schlafer of First Branch Bonsai will be holding workshops by pre-registration only. For more information please contact Ira Sisson (206) 852-6510 or irasisson@hotmail.com.